clean room with bathtub, smoke smell a little when check in. very close to southern cross station and skybus. shopping and eating no problem. near free tram zone also. recommended but room need attention on the smoke smell in non smoking room. This hotel is situated a stone's throw from Southern Cross station/Woolworths, 7Eleven, Coles and Southern Cross outlet stores, free trams, Melbourne Convention Centre, South Wharf DFO, and Victoria Market. Swanston St is a 10 minute walk away. Large room (16m2) with double block out pull down roller blinds. Comfortable bed and quiet area. Luggage storage or paid ($7 for 5 hours) lockers. This hotel provides great price at great location. staffs are very helpful too. called me to inform when early check in was possible. another one brought me extra heater when the one in my room was not working. the other offered to call a cab. Room was okay and clean. Everything went well.. The hotel staff was very helpful and friendly and attend to our needs. Just a short time needed to check in unlike others where the required lots of documentation. What i really like about this hotel is it very close to southern cross station, just about 5 mins walking distance. Skybus operated day and night and with reasonable fee i guess its really means a lot to those who travel within a budget. close to transport, shopping and dinning. Nice hotel. Walking distance to sothern cross station. Close to transport. Close to many attractions. There is a free tram so you can travel around Melbourne. Staff are freindly and helpful. Victoria markets are close by and within walking distance. Couldn't have gotten a better hotel deal at such a reasonable price. The hotel was clean, brightly lit, showers great, bed comfortable. It's centrally located with friendly hotel staff and a real value for money deal. Only negative point is tthe early checkout ady 11am with no flexibility to extend the check out time without incurring additional charges. Minor point which is overshadowed by the overall positive experience. It is generally a pleasant n comfortable stay. It's very near to Southern Cross Station so if one is taking Skybus (airport transfer) bsck to airport, it is really accessible. Some nice chinese dumplings n jap ramen restaurants within walking distance from the hotel. Just that the housekeeping service can be improved- the replenishment of toiletries n towels is a bit random (got extra bath towel instead of replacing hand towels etc). Overall it's value for money. The hotel is in CBD and easily accessible. The hotel is very near to Southern Cross Station. And you can reach anywhere in the city by a short walk. The room is clean. Overall, it's a good experience with Hotel ibis. great location. close to train station and airport express hall. nice restaurant, bar and cafe around. get a little bit noisy during weekend if stay close to the ground. service is good. security is good. walking distance to major attraction. great price for the hotel. will stay here next time. Location was perfect for my purpose. 200 metres from Southern Cross station. 100 metre walk to tram if you want to go to Elizabeth st or Swanston st, otherwise its only a 10 min walk. Also 10 min walk to the Crown casino. My stay at the ibis Little Burke street was perfect. It was quiet, yet close to trams, trains and buses. If you arrive at Tullamarine airport, you simply get the sky bus from the airport into Southern Cross station and then the ibis is only a 200m walk. Why pay $50 for a taxi each way, when you can pay $28 return for the bus and it almost takes you to your hotel. (200m walk) Rooms were clean and quiet. The gym was adequate for what i needed but small. Staff were very helpful with any questions i had. I thoroughly recommend it and will stay here again providing the price is competitive and i can get a good deal next time. the hotel is conveniently located within walking distance from the southern cross station. i have a very pleasant surprise of the convenience of travelling from melbourne airport using the skybus. all in all, it takes me less thatn half an hour from the airport to the hotel. the counter staff was pleasant and helpful. i managed to checked into my room although i arrived relatively early at about 9am. it is also very conveniently located within melbourne and most of the places of interest are within walking distance from the hotel. good value for the rate that i pay. We are thrilled our location suited your needs. We hope to see you again soon. Stayed 4 nights. It's OK but a little dated. There's a noises nightclub next door and despite the sealed double glazed Windows we could hear it into the early hours on Fridayand Saturday nights. Overall the corridor and rooms were "tired" and ready for a refresh. A bit expensive for what it is. There's better value on the CBD area. Thank you for your feedback - sorry to hear that aspects of your stay were not to your liking. We will submit your comments for future consideration of the design and technical team. Location near Southern Cross location, nearby got lot of restaurants. Old water boiler. Thank you for sharing your experience with us we really do appreciate it. We hope to see you again soon. We are thrilled that our location suited your needs and that your found our hotel neat. We hope to see you again soon. Thank you for your support - we do appreciate. Our staff were thrilled with your comments. - we are pleased to hear you enjoyed your stay with. Thank you for sharing this with us. 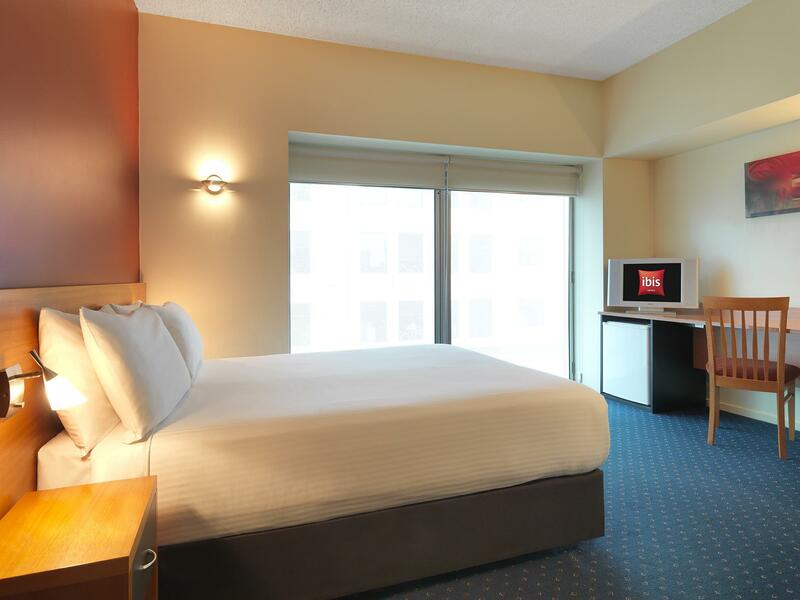 The Ibis Melbourne Bourke St Hotel is well situated at 600 Little Bourke St Melbourne. This is a short walk from Southern Cross Station where the Skybus Depot is. A very convenient location for the Southern part of Melbourne CBD.The staff were friendly and helpful and directed me to a very cheap and convenient Vietnamese Restaurant "PHU24" on the corner of Little Bourke and Spencer Streets. The hotel was clean and adequate for the price. I would stay there again, especially when my business takes me to that part of Melbourne. Helpful front desk staff. Very convenient location, 2 mins walk frm Southern Cross station ( train and skybus airport to city shuttle). Various eateries and convenient stores within 2-3 mins walk. 12-15 mins walk to Bourke Street mall or Crown complex. Also within free tram zone which is handy. Would stay again when in Melbourne CBD. สถานีรถไฟ Flagstaff - ระยะ 0.39 กม.